Tåsinge Plads is Copenhagen’s first climate change-adapted urban space. The square is a green oasis, which both handles large volumes of rainwater and creates a place for the neighbourhood’s residents to meet. Here urban life is combined with nature. There are urban life and cobblestones on the square where people can enjoy a coffee and the green view. A few metres away it is possible to go on discovery in the luxuriant ‘Danish rainforest’. Here 1,000 square metres of unused asphalt has been turned into ‘wild’ urban nature. Climate change adaptation on Tåsinge Plads is to control and retain as much as possible of the rainwater falling around the square. Towards the west the landscape is raised above ground level to provide space for the existing trenches and create a slope facing the sun, where visitors can go to enjoy a cup of coffee or play games. From here the landscape slopes away towards an area at a lower level, where the stormwater collects. Diverting and percolating rainwater from roofs and squares locally keeps the water away from the sewers, and we ensure in this way that there is capacity in the sewer to cope with the torrential downpours of the future. 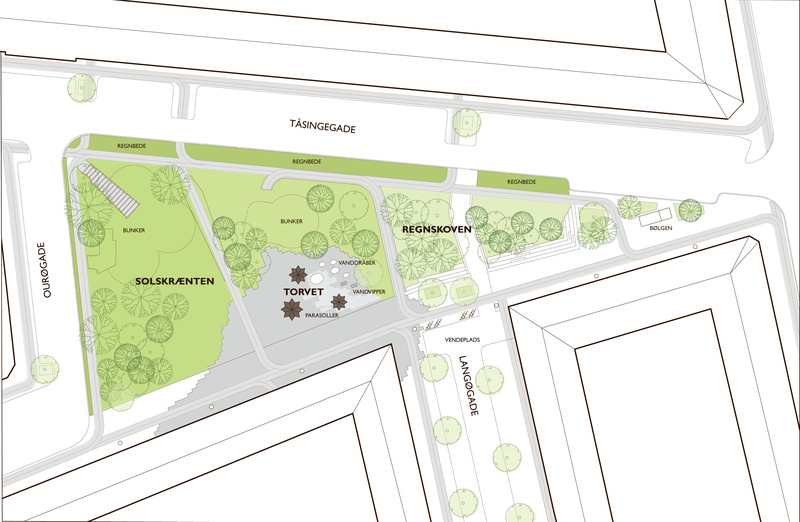 Altogether, Tåsinge Plads can delay and percolate rainwater from a surrounding area of 4,300 m2. On Tåsinge Plads wild nature is placed in an urban framework. The design of the square is inspired by the “Copenhagen pavements” that run through the neighbourhood as a local symbol. The pavements are routed from the entrances of the buildings through the square, and in that way are divided into small urban spaces and activity sites. It is a framework that provides space for local nature to be able to grow wilfully wild without appearing untamed. Rain, wind and sun are welcomed here, while the rhythm of the city is seen and noted. In the middle of the square are ‘water parasols’ and drops as structural elements that collect the water, so that children can use it for play. The water is pumped out onto the surface, where it runs in small channels on the surface out into the green space. 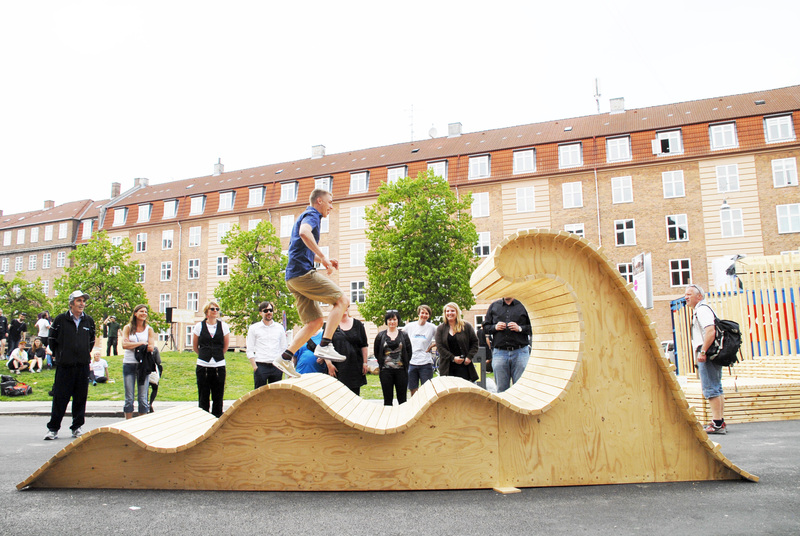 As a result of a number of different temporary projects in dialogue with the population of the neighbourhood, Tåsinge Plads has already become a living part of the urban environment. Here neighbours can now meet, take their dog for a walk or test their strength on the activity equipment. This has a created blossoming, creative urban life that helps in strengthening familiarity, community and a ownership among the local residents. 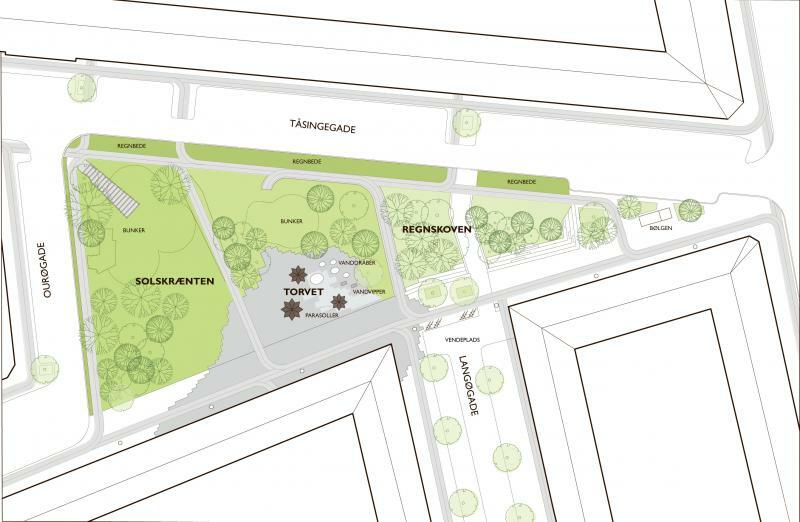 This engagement provides an ideal basis for the transformation of Tåsinge Plads, so that the neighbours continue to be actively engaged in the development of the square. 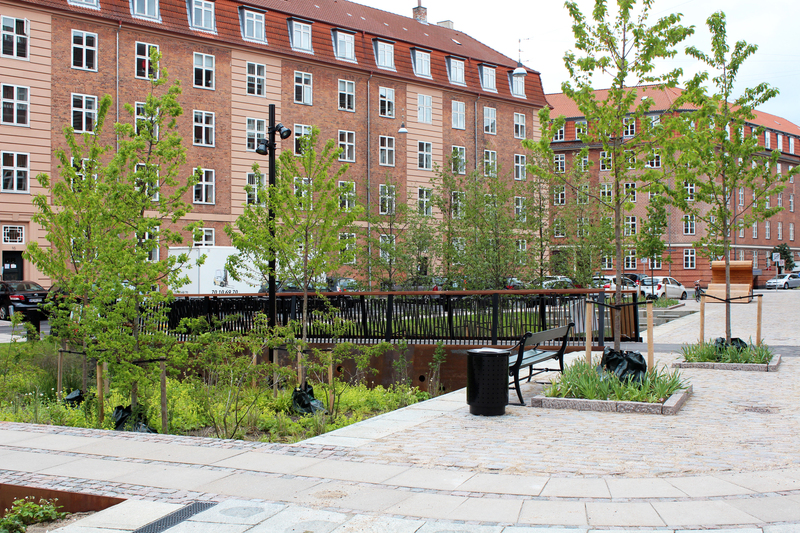 If you would like to know more about design, planting and technical rainwater solutions on Tåsinge Plads, tjek out this brochureyou can read the brochure.